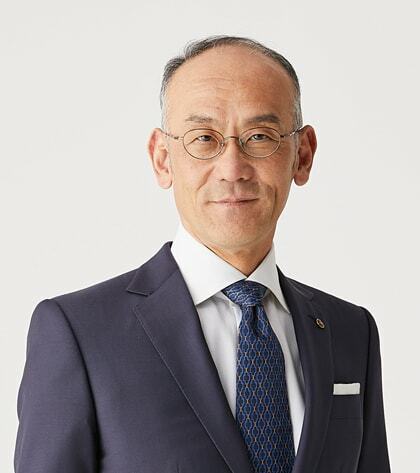 Top Message - Company information | Yamaha Motor Co., Ltd.
President, Chief Executive Officer and Representative Director, Yamaha Motor Co., Ltd. The Yamaha Motor Group’s corporate mission is to be a “Kando* Creating Company – Offering new excitement and a more fulfilling life for people all over the world,” and we operate under three management principles: Creating value that surpasses customer expectations; Establishing a corporate environment that fosters self-esteem; and Fulfilling social responsibilities globally. Based on this corporate philosophy, we have constantly pursued new challenges, leading to the opening of new markets, the creation of unique products, and the development of a wide range of businesses. Our company as it exists today was built on this history. At the same time, we are facing an era of major transformation. The Paris Agreement to combat climate change, adopted in December 2015 at the 2015 United Nations Climate Change Conference, also known as COP 21 (the 21st yearly session of the Conference of the Parties (COP) to the 1992 United Nations Framework Convention on Climate Change (UNFCCC)), set a target of holding the rise in the average global temperature to less than 2°C. However, products that use internal combustion engines account for roughly 90% of Yamaha Motor’s net sales. I believe the trend toward electric vehicles being seen in the automobile industry is bound to extend to the motorcycle industry as well. This development figures into our medium- to long-term business strategy as both a risk and an opportunity, and along with strengthening our competitiveness in the electric commuter segment, we are emphasizing products that use robotics. We are also pursuing innovation that will lead to the realization of a society that is not dependent on carbon-based fuels. The 2030 Agenda for Sustainable Development, which lists a set of common, international Sustainable Development Goals (SDGs) to be achieved by 2030, was also adopted at a United Nations summit in 2015. As a global company with businesses in more than 180 countries and regions, the Yamaha Motor Group is working to achieve the SDGs through its products and services, and to contribute to society through its business development. To demonstrate our determination both inside and outside the Company, and to promote activities that address these environmental, social, and governance principles that society expects us to uphold, in 2017 the Yamaha Motor Group became a signatory to the United Nations Global Compact, a set of 10 principles in the areas of human rights, labor, the environment, and the prevention of corruption. As we operate our global businesses, we require that the Yamaha Motor Group itself and our entire supply chain understand and comply with this framework. Going forward, we will engage in a commitment to international agreements, while emphasizing harmony with local communities, society at large and the global environment, and promote activities that will lead to the realization of a sustainable society, to become a company that earns the trust of stakeholders. *Kando is a Japanese word for the simultaneous feeling of deep satisfaction and intense excitement that we experience when we encounter something of exceptional value.